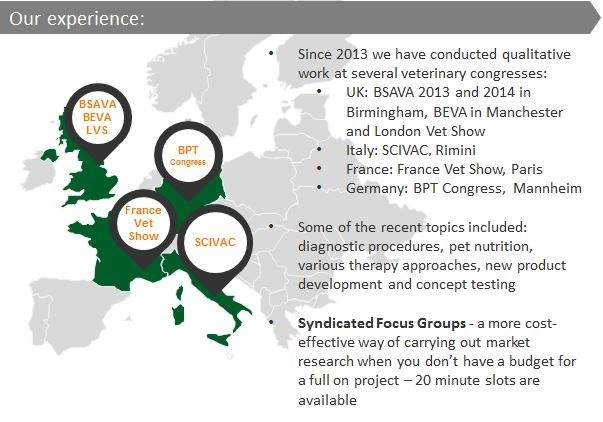 Using our knowledge of the sector, recruitment capabilities and presence at veterinary exhibitions, we run qualitative research at veterinary congresses across Europe. We use our network of experienced freelance moderators with knowledge in animal health and pharmaceutical market research. Some of the recent examples of our qualitative work include focus groups and in-depth face-to-face and telephone interviews in France, Italy, Germany and UK. We also offer work outside veterinary congresses and syndicated focus groups – a more cost-effective way of conducting qualitative research. Please complete the fields below to receive a Vetsqual product sheet with more details – you will receive an e-mail with the link to download a PDF file.